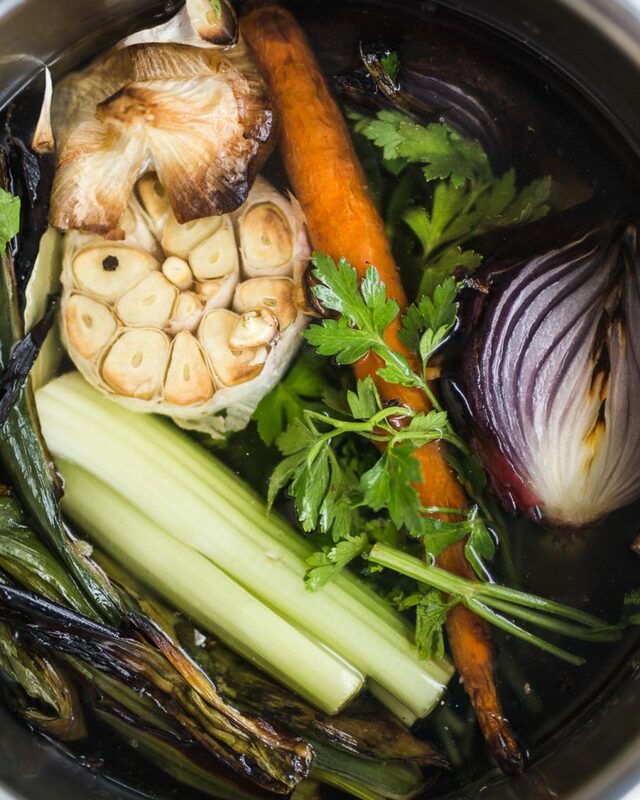 Beef bone broth is not only packed with valuable nutrients, it’s an ideal cooking liquid. 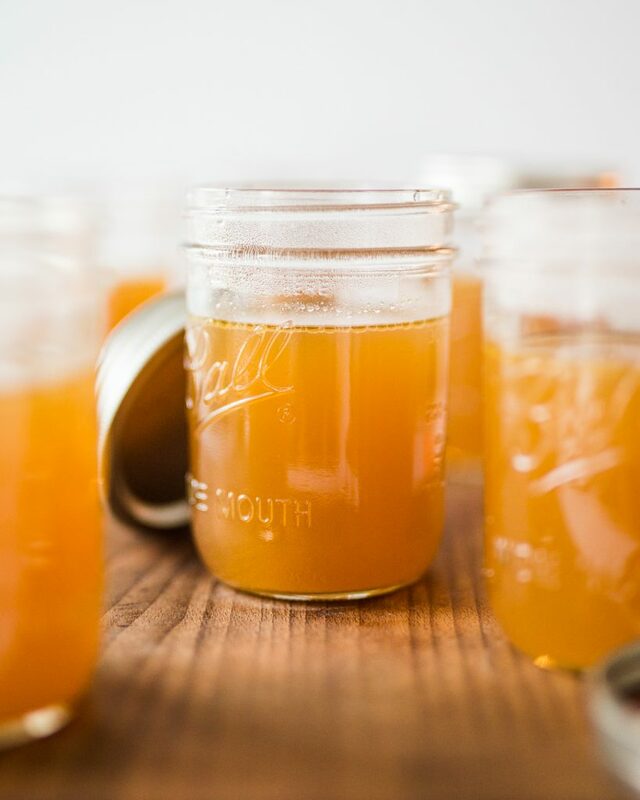 Beef bone broth can help improve skin quality, repair torn cartilage and damaged joints, fix ‘leaky gut’ syndrome, build stronger teeth, raise your immune system and improve your overall health. 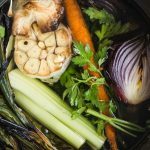 I’ve touched on the differences between regular broth and bone broth before (see here), but it’s worth quickly mentioning the key points again. It boils down (pun intended) to ingredients, cooking time and nutritional profile. Bone broth is usually made with more bones than regular broth (or bones exclusively), it is cooked for a longer period time and, therefore, yields a more nutrient dense finished product. The increased cooking time allows for precious collagen and gelatine to release from the bones into the broth. Beef bone broth requires the exact same cooking process as chicken bone broth (or turkey, pork, or other meats for that matter). However, when making beef bone broth, I tend to start with raw bones, as opposed to the pre-roasted ones I salvage after making my Emergency Roast Chicken, for example. Marrow bones are ideal for making beef bone broth. 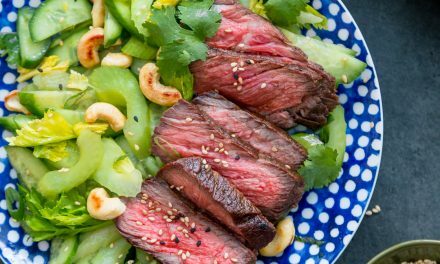 They are packed with collagen and are loaded with delicious flavour. You can purchase these from your butcher or try looking through the meat freezer of a local Whole Foods, if one is in your area. Another fantastic alternative is to use beef or veal shanks (the same cut used to make Ossobuco). 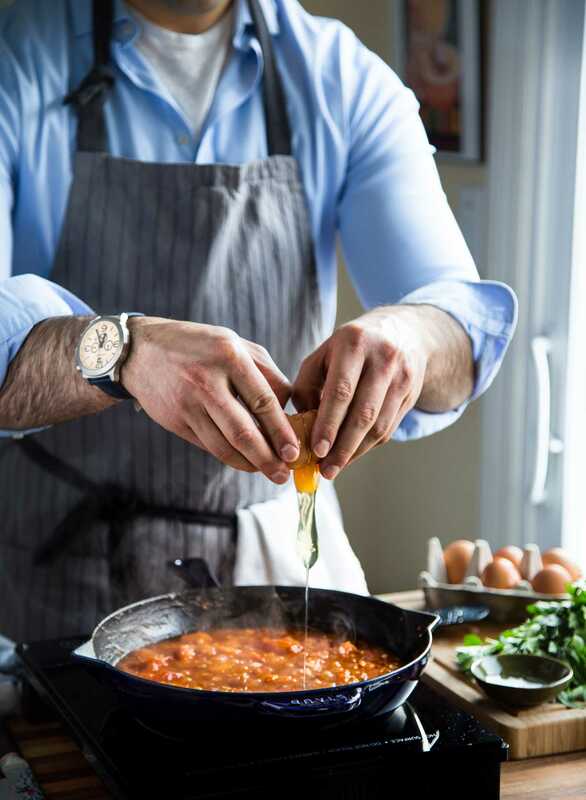 Not only will you get plenty of nutrients and flavour out of the bones and cartilage, but you can also save the meat after boiling the broth and add it to a tomato sauce for a quick-and-easy ragu. Shank bones usually cost more than marrow bones but you get the added bonus of having edible meat. 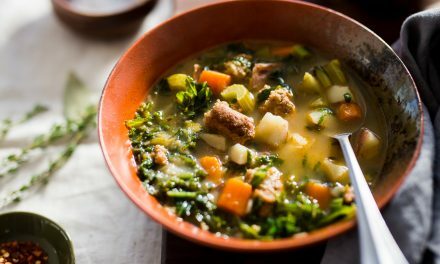 Bone broth can be made on the stovetop, in a slowcooker, in a traditional pressure cooker, or in an electronic pressure cooker, such as the Instant Pot. 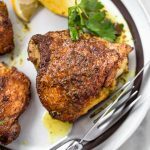 I prefer the Instant Pot for convenience but nothing beats the flavour of a low-and-slow braise. Therefore, if you have the time, simply follow steps 1-3 listed in the recipe below before adding everything to a stock pot or slow cooker. Then cook on the lowest heat setting for 24-72hrs. Yes, it’s a commitment. But it’s one worth making! Blanching (or quickly boiling) the bones in plain water will help draw out so-called impurities in the bones themselves, which float to the top as a foam or ‘scum’ and can be skimmed with a spoon. I’ve read a wide variety of theories as to what these impurities are and whether you should bother skimming them. Personally, I skim because it’s the way my mother and grandmother taught me to do it. If you don’t skim, you’ll likely end up with a cloudy broth that isn’t as visually appealing. As for what the impurities are, they are most likely amino acids that coagulate and rise to the surface. One reader suggested the scum arises from marrow being pulled out of the bones, but I find it hard to believe that would happen after only a few minutes of light blanching. Clearly, I have some more research to do. 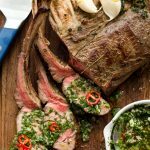 If you are starting out with raw beef bones, which is most likely the case, you should definitely consider quickly roasting them in the oven before boiling, but after blanching. While you’re at it, thrown some aromatics on the tray next to them. Roasting the bones and aromatics will help develop and concentrate flavours. Like blanching, it’s not a mandatory step but I think it makes for a much more interesting flavour profile, which is important if you’re drinking this stuff by the glass or adding it to soups and stews. Almost every single bone broth recipe I’ve encountered calls for adding a splash of apple cider vinegar to the pot. Many people say the vinegar helps draw out the collagen in the bones. Personally, I’m not convinced. My parents have been making bone broth before the invention of the internet and never added any such thing. Nevertheless, they easily made freakishly gelatinous broth. Contrary to popular belief, I actually don’t think this is an essential ingredient for achieving a gelatinous broth. Instead, the secret seems to be using the correct bones. As mentioned, look for ones that have a lot of marrow and connective tissue! I’m sure adding apple cider vinegar doesn’t hurt. But I’m just not a fan of the flavour it imparts. I tend to leave it out but have included it in the ingredients as optional for those who would like to try it. If you’re already going through the trouble of making beef bone broth from scratch, you might as well make as much of it as possible and freeze whatever you don’t need. Personally, I like freezing in mason jars and ever since I shared the process of making and freezing my Chicken Bone Broth recipe on my Instagram Stories, my inbox has been flooded by readers in disbelief. Rest assured, you can indeed freeze mason jars. HOWEVER, there are some caveats! Make sure your broth has come to room temperature before placing it in the freezer. The drastic change from a hot to cold climate will likely shatter the glass. Note: Unless your mason jars are cold to begin with, you don’t have to wait for the broth to come to room temperature before pouring it into the jars. In fact, I recommend portioning the broth into jars immediately after cooking because it will help speed up the cooling process. The bigger the pot of hot broth, the longer it takes to cool. Tempered glass is much stronger than regular glass, which will allow it to withstand sub-zero temperatures. I recommend these 16oz wide-mouth Ball mason jars. They are made with tempered glass and the wide mouth is very practical. The larger tops make them more stackable, easier to pour liquid into and I can actually fit my giant hand into the jar when cleaning with a sponge. Pro Tip: if you’re in the Greater Toronto Area, you can purchase Ball Wide-Mouth Mason Jars at Creative Bag. This is usually where things go wrong for most people! It is imperative to leave at least a few inches of headroom in each jar. In other words, don’t fill the jars all the way up with broth. Unlike other liquids, water actually expands by about 9% when frozen and if there’s no room for it to do so, it will crack the glass. Bone Broth is, after all, made of water. The last piece to the puzzle is using your frozen broth after it’s been frozen. To do so, simply defrost in the fridge until completely thawed. The time it takes to thaw depends on the volume of the broth. A larger jar will take longer. I do not recommend microwaving bone broth frozen in mason jars for the simple fact that it will likely shatter. Again, a drastic change from cold to hot temperatures will crack the glass. To speed up the process, you can try submerging the mason jar in a bowl of room temperature water. This will gradually warm up the broth in the jar. Just be sure to change the water in the bowl every so often since it will likely cool down before the broth warms up. Fill Instant Pot halfway with water. Set to sauté mode and bring to a simmer. Add raw beef bones and blanch 15-20 minutes. Use a spoon to remove any foam that rises to the surface. Transfer blanched bones to a bowl of cold water or rinse under the faucet. Meanwhile, pat blanched bones dry with a paper towel. 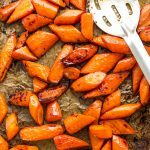 Add to a parchment paper-lined sheet pan or roasting tray along with the onion, carrot, parsnip, leek tops, garlic and ginger. 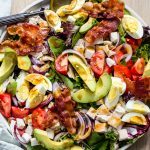 Drizzle everything with a small amount of avocado oil. Transfer to oven and roast 15-20 minutes - flip everything halfway. 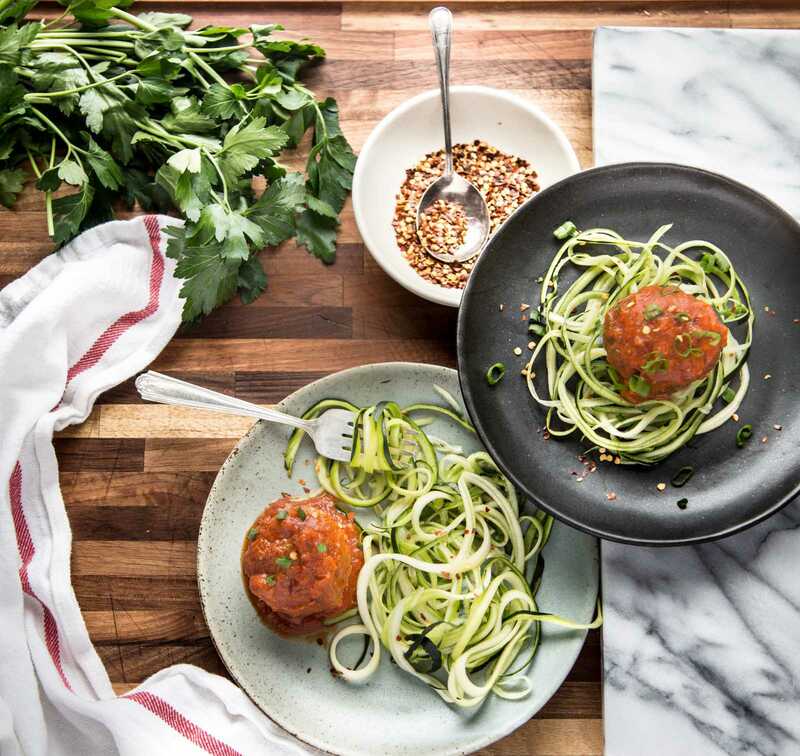 Add all roasted ingredients to an empty Instant Pot along with celery, bay leaves, parsley, apple cider vinegar, salt, and pepper. Fill Instant Pot with water up until the ‘max’ line. Set Instant Pot to Soup mode, high pressure, for 180-240 minutes (or longer). Close lid, set valve to sealing and let cook. Once cooking time has elapsed, depressurize manually or naturally. To store, pour broth into tempered mason jars. Be sure to leave at least 2" of headroom if freezing. Alternatively, freeze in large, silicon ice moulds. Once broth has frozen, transfer ice cubes to a freezer-safe bag for easy storage. Repeat process until all broth has frozen. 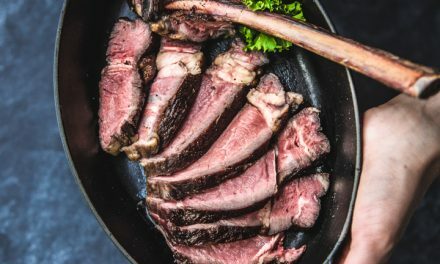 I thought the addition of vinegar is supposed to aid with the calcium extraction from the bones leaving the bones brittle at the end of the cooking process (no calcium). Have you heard anything related to that? I also don’t enjoy the flavor of the vinegar in the broth but have been adding it nonetheless hoping to end up with more calcium for myself. I haven’t but, as mentioned, I think I have some more research to do! How long would you say it will stay good in the fridge if you don’t freeze it? Yes, from my experience, the vinegar does not make a difference in how much gelatinous the broth is. Also, I heard Paleo Mom explain, that for the vinegar to extract more minerals from the bones, you would have to use an amount of vinegar, which would make the broth largely inedible. I would say, a little bit of an acidic component (like often tomatoes in Italy) is rather used to balance the taste. I recently had a chance to get organic turkey necks and these produced very nice, gelatinous broth. The best beef broth, in my opinion, is from combination of bone and oxtail. Personaly, I do not like to use bones with a lot of marrow, because of all the fat that needs to be filtered away. Very good to know I’m not alone! What kind of bones should I get and from where? Will they let me buy just the bones? Thanks in advance!! 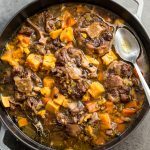 You can use oxtail, marrow bones, or even shank bones. Your best bet is to find a local butcher that stocks grass-fed beef. They will most likely happily sell you bones. If not, many Whole Foods meat freezers have packs of bones. Also an option, try finding an online butcher that delivers. Beef bones are often an option. Can you blanch the beef bones from frozen or do they need to thaw first? Great question! Yes, you definitely could blanch from frozen. However, if you are roasting them first, keep in mind the added time it would take to bring the bones to temperature if you are roasting them with the aromatics. Make sure the vegetables don’t burn before the bones have had a chance to caramelize. When do you add the parsnip? Was that supposed to be roasted? Sorry about that, I’ve edited the recipe. The parsnip is to be roasted along with the other vegetables. If using frozen aromatics/veggies, how do I roast them? Do they need to thaw first or should I even bother roasting them? You can roast from frozen! Feel free to use less if preferred.